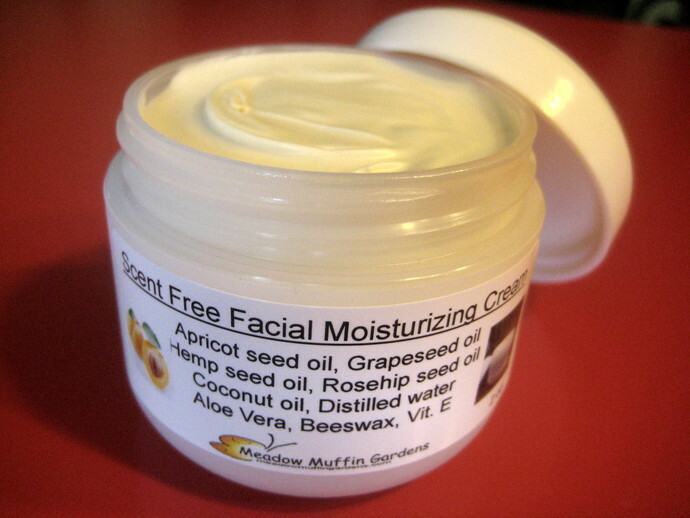 An all-natural, skin nourishing, scent-free facial moisturizer without added essential oils. This cream is similar to another scent free cream we carry in the shop except this one is a little more geared for the person with more mature skin and concerned with the effects of aging. The recipe includes Rosehip seed oil and Hemp seed oil. 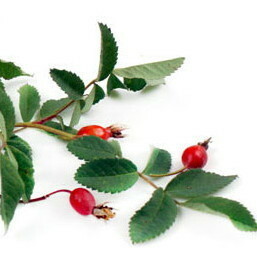 Rosehip seed oil can often be seen in products advertised for maintaining a youthful appearance. High in Vitamin A, Vitamin E, and essential fatty acids, this precious oil is very effective for healing and rejuvenating dry or damaged skin. It is a very gentle hydrator which means it quickly penetrates skin. It is said to be the only natural oil to contain retinoic acid (Vitamin A), which increases levels of collagen and elastin, necessary for supple, smooth new skin. 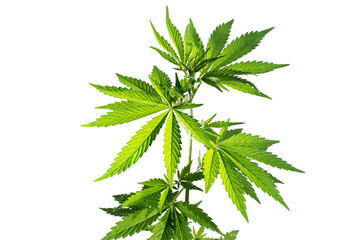 Hemp seed oil is gaining well-deserved popularity in skin care. The oil is rich in essential fatty acids, omega-6 and omega-3, prevents moisture loss in the skin, all what we want in the battle against aging and maintaining healthy skin. Increasing popularity of hemp oil in personal care is largely due to its high EFA or Essential Fatty Acid content. Hemp oil is a good source of omega-3 and omega-6 fatty acids, which are called essential fats because they are needed to maintain healthy cells, nerves and brain function. These fatty acids have to be absorbed from food since the body does not produce them. A deficiency in these fatty acids can cause skin problems involving dry, rashy, itchy, red skin as well as facial break-outs. Containing anti-inflammatory properties and rich in antioxidants, vitamin E and vitamin A, hemp oil hydrates and nourishes the skin so acts as a wonderful moisturizing, healing choice for an oil. Apricot kernel oil is a mild and gentle seed oil high in Vitamin E, a good alternative for those with nut allergies. The oil is cold-expeller pressed which means no chemical solvents were used to extract the oil. Apricot seed oil is very beneficial for all skin types, such as dry mature skin, or irritated, sensitive skin. Grapeseed oil is also good for all skin types. High in anti-oxidants and containing astringent properties, it is beneficial for oily or blemish prone skin. The gentle, nearly odorless qualities of grapeseed oil help keep the skin hydrated and supple while absorbing easily without feeling greasy. Coconut oil contains antifungal and antibacterial properties from the presence of lauric acid, capric acid and caprylic acid. Known for its ability to help skin retain moisture, this wonderful hydrator is often used for chronic dry skin and as a hair conditioner. Cooling coconut oil is used to help emulsify and stiffen the cream. For this cream, I use the unrefined coconut oil. The coconut scent is not strong, actually just a hint, but if you do not want any trace of a scent of coconut, then let me know and I'll use the refined coconut oil. For those who prefer a substitution for coconut oil, we can use what is called African Cocoa Butter or Shea Butter. The shea nut is harvested and ground into a rich vegetable butter that offers multiple benefits for the skin: protecting, nourishing, moisturizing, soothing, comforting, healing and regenerating. Shea Butter easily penetrates the skin allowing the skin to breathe without clogging the pores. The addition of shea butter is a good idea for those with oily skin. Shea butter offers a little fluff to the final cream. Moisturize as needed onto clean skin, ideally while the skin is still moist after cleansing. Use gentle, circular motions with your fingertips, paying special attention to the delicate area around the eyes. If you wear foundation wait a few minutes for the moisturizer to soak in or you could dab any "shine" with a soft cotton square. Due to various skin types, you may need only a tiny bit at a time, or perhaps only the cheeks and around the eyes, or you may just need a moisturizer as a night cream. Keep in mind that this cream has a higher oil:water ratio than you may be used to; very effective for dry skin. To minimize the risk of contamination make sure you have clean fingers before dipping into the cream or use the little wooden spatula (included). Beauty tip: Don't forget to moisturize your neck! Items are made in small batches as they are needed. The concept behind this shop is for the consumer seeking all natural products with the understanding that the items are not intended to sit around and only natural preservatives are used. Natural preservatives are antimicrobial grapefruit seed extract, antioxidant Vit. E and the concentration of essential oils. What this means is that while these natural preservatives deter the growth of bacteria and molds, they are not broad spectrum and offer a limited shelf life. Being the risk of contamination and loss of potency over time is present in any perishable product, please try to use the item within 3 to 4 months. Products which contain water such as the creams and lotions are the most at risk for contamination. The salves, containing no water, are very stable as is and are fine for months. Keep any of the products in a cool location, out of exposure to heat and sunlight, and be sure to have clean hands before using. Refrigeration will extend the shelf life of perishable items.